Del Vance helped found Uinta Brewing Company, The Bayou and authored Beer in the Beehive: A History of Brewing in Utah. His latest venture Beerhive Pub (128 S. Main) is a welcome addition to downtown. Vance developed a cool way to beat the heat by turning part of the bar’s counter into a strip of pure ice (leave your beverage for too long and it will “ice up,” says manager Matt Pernichle). Beerhive serves hard-to-find microbrews from breweries such as Deschuttes in Bend, Ore.. Pair a frosty mug with Hungarian beef goulash from neighboring Vienna Bistro. Beerhive is open noon till last call. 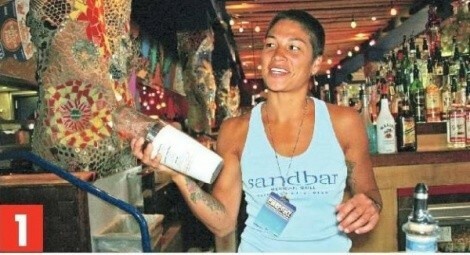 Saddle up to the closest thing Utah has to a beachfront Mexican paradise at the Sandbar (122 W. Pierpont Ave.). The downtown nightclub/restaurant boasts one of the best tequila-infused menus in the city, with everything from traditional to the trendy pomegranate margarita and the Cadillac of all margaritas, appropriately named the Pink Cadillac, a drink Sandbar bartender Ester Imotan has down cold.